by Elizabeth Esten In the grand scheme of Disney Animation’s history, the 1970s and ’80s is a strange period. Risks were taken to try to find a new direction, especially after the death of Walt Disney in 1966. Disney’s influence over many projects has brought a few duds over the years, but his guidance has mostly produced classics that have stuck with kids of multiple generations. One of the most beloved films overseen by Walt Disney is 1967’s The Jungle Book. Remaking The Jungle Book for a modern audience may have been a challenge, but director Jon Favreau pulled it off, creating a film that stands on its own. Deep in the jungles of India, a young boy named Mowgli (Neel Sethi) is raised by wolves after being abandoned as a baby. Brought up with the guidance of Bagheera (Ben Kingsley), Mowgli’s life changes when a menacing tiger named Shere Khan (Idris Elba) discovers a human is in the jungle, which forces the boy to run away before he is eaten. With the help of his new friend Baloo (Bill Murray), Mowgli must learn to gain the courage and strength he needs to fight back and save his family before it’s too late. While the story of this new Jungle Book is essentially the same as its animated counterpart, what makes this version stand out from the other live action adaptations is the look and feel of the realistic CGI. Basically a 3D animated film with one human actor, the film is visually striking from the very beginning. The visual effects are gorgeously rendered, especially when it comes to the animals. When Mowgli pets the creatures, the fur moves in a stunningly lifelike manner. The jungle landscapes are also fantastically realistic, making you forget the entire movie was shot against a blue screen. The voice acting is great across the board as well. For me, the standouts are Ben Kingsley as the stoic and caring Baghera and Bill Murray as Baloo. Murray’s never been more perfectly cast, communicating so much about the character simply through his voice— casual and laid back, but also expressing the deep love he feels for Mowgli at the end of the film. Kingsley’s strength comes from his ability to show the character’s inner conflict. Bagheera is often torn between doing what’s “right” and what his heart is telling him he should do; this struggle really comes across in Kingsley’s vocal performance. While the visual elements are fantastic and the performances are excellent, the film’s weaknesses tend to pop up in the pacing. The first act is very well done, but the middle tends to meander in spots, slowing the movie down too much. The pace picks back up in time for the climax, but the second act’s pace forces the movie to play catch up and things feel like they’re happening far too quickly. 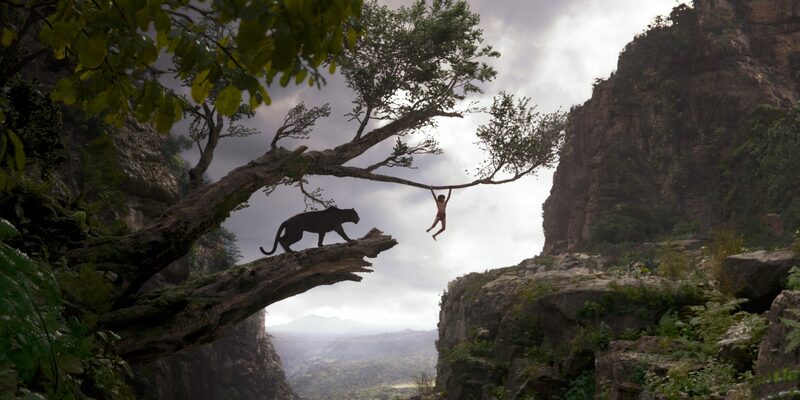 Because of the striking visuals, I would say it’s essential to see The Jungle Book during its theatrical run. The scale of the movie is so great that watching it on your tiny desktop will lessen the experience. During my screening, a feeling of nostalgia and happiness came over me, especially during the film’s smaller character moments. It’s a solid and entertaining film, with great voice acting across the board and fantastic-looking CGI. The pacing may be mixed, but the film is definitely worth seeing for a great visual experience.